Translated directly from the original text in classical Japanese (kobun). Parts of the tale have been omitted for simplification purposes. 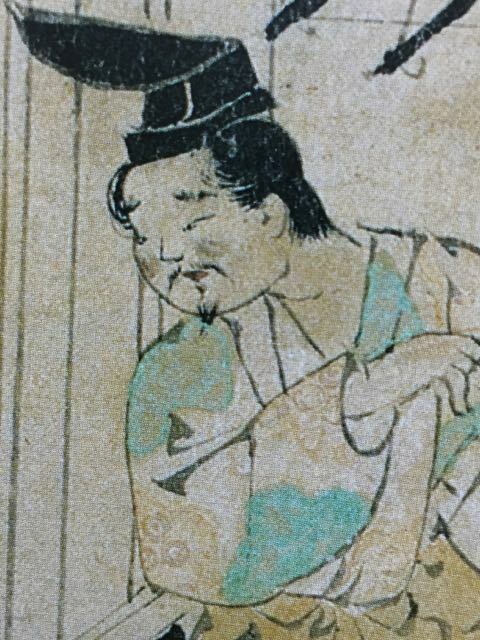 The Illustrated Tale of Obusuma Saburō tells the story of two brothers of a warrior family, who lived opposing lifestyles that developed into a tragic drama with unknown ending. The origin of the tale and identity of its author are unknown, and evidence supporting the authenticity of its narrative is lacking. Similarly, there is no definitive documentary supporting the actual existence of these brothers. 1. 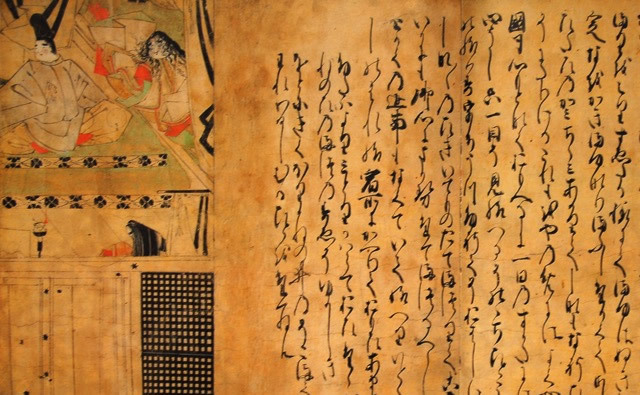 The author refers to the father of the two warriors, Obusuma and Yoshimi, by his title Great Vice-governor of Musashi Province (Musashi Ōsuke). There is no mention of family or first names. 2. There is no Obusuma house in any record. Obusuma refers to Obusuma District in Musashi Province. Thus it is a geographical identifier for a person called Saburō. However, even “Saburō” is not a personal name. It is rather an identifier of a son’s position in relation to other sons. Thus, Tarō is the first born, Jirō is the second born, Saburō is the third born son, and so forth. These may be viewed as secondary middle-names that cannot serve to independantly identify a person in any lineage. 3. Yoshimi is the name for a district adjacent to Obusuma District. It is also a family name that is mentioned as early as mid-Heian period, but possibly was in existence since earlier times. There is also a Yoshimi lineage that began in the very early years of the Kamakura period when one of Minamoto-no-Yoritomo’s nephews, Norimaru, was shed from the main Minamoto lineage and given the new lineage name of Yoshimi. 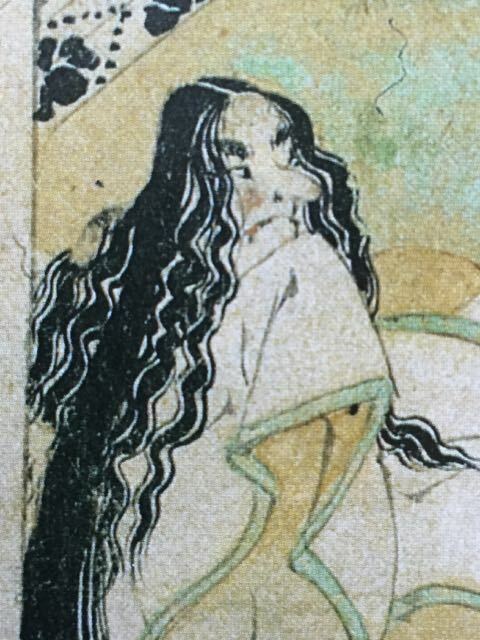 However, neither this lineage, nor other references to Yoshimi in contemporary records, correspond to the details provided us by this illustrative tale. 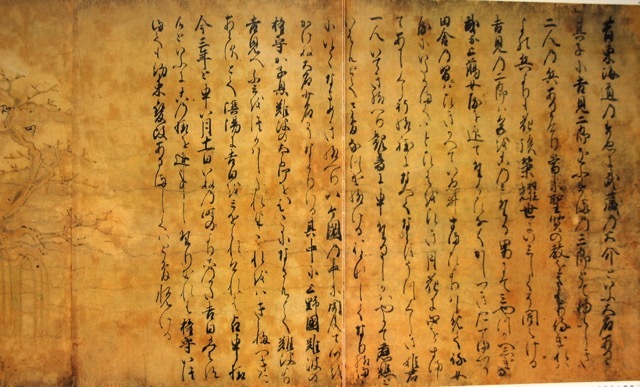 At this time, and until clear evidence becomes available, Yoshimi Jirō refers to a second son (jirō) of an unidentified family who resides in Yoshimi District. 4. The author is unknown. It is also unknown whether the illustrative tale was produced by one person or a writer and a painter. 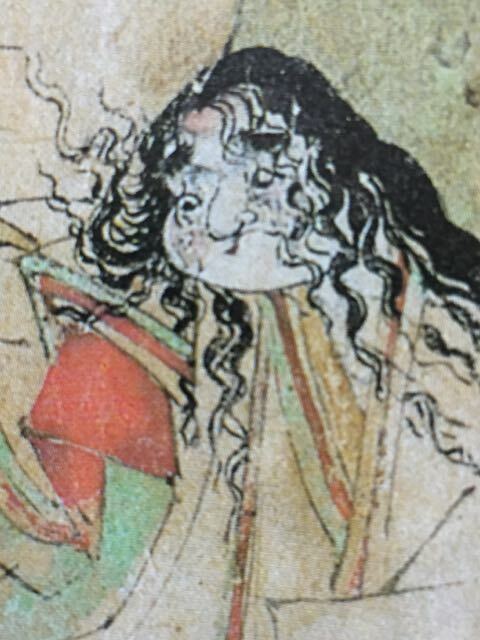 However, due to apparent similarities with another illustrative scroll, the work is attributed to Tosa Takasuke who produced it during the 1290s. Once upon a time there was a local magnate (daimyō) called Musashi Ōsuke at the end of the Tōkaidō highway. He had two outstanding warrior sons: Yoshimi Jirō and Obusuma-no-Saburō. Yoshimi Jirō adhered to the teaching of the sages and served them. He was aptly known to be unlike warriors of the realm for his splendour and nobility. Yoshimi-no-Jirō was a man who liked women. [Then], having married a court-lady, he cared for her like no other, and replaced the ways of the countryside [with those of the nobility]. He played the Biwa and Koto to all, from household attendants to women and samurai, and cleansed his heart in moon and flowers viewing. Into this bright life was born a daughter of unparalleled beauty. Because they had appealed to Kannon [for a child], they named their daughter Jihi (mercy). Word of her calm and charm spread within the Eight Provinces, and nobody, high and low, could ignore her. 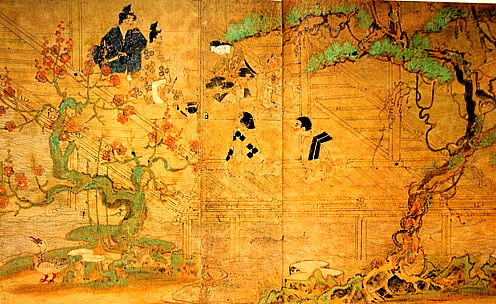 Among these men was the son of Nanba Gon-no-kami of Kōzuke Province, Nanba Tarō. [Gon-no-kami] sent a letter from Nanba to Yoshimi expressing his wish to marry his son [to Yoshimi’s daughter]. As this was agreeable, a message was sent to Gon-no-kami, stating that an In-Yo fortune telling was conducted to indicate an auspicious day [for the wedding], and that the Hour of the Dog on the 11th day, 8th month, of the third year from that time was the only auspicious day. Until then, there will be no change in the engagement. [Gon-no-kami] was indeed rejoiced. 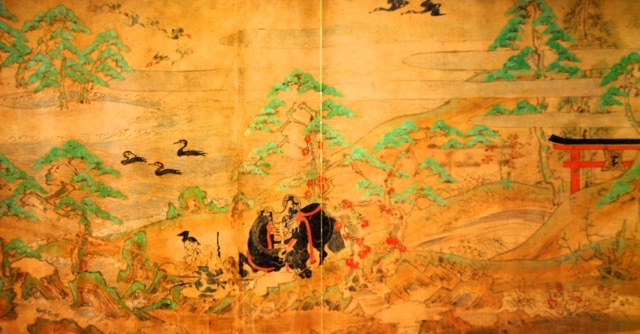 The young men and Masazumi, having been born to this house of valour (buyo no ie), observe its principles. There was no purpose in gazing at the moonlight and viewing flowers, reciting poems or learning to play musical instruments. 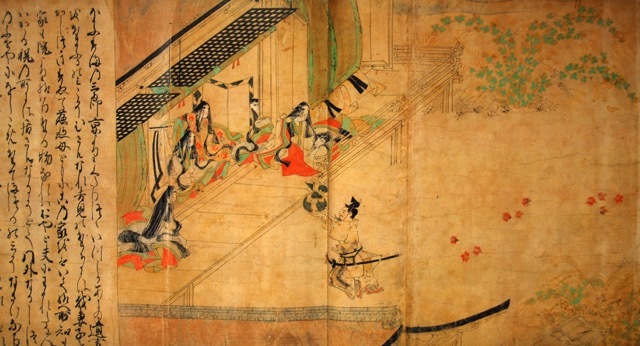 Should those who prepare for battle be pulling the calligraphy brush or playing the flute? 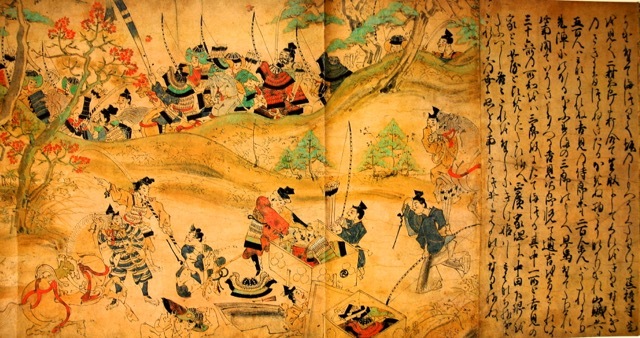 Everybody in that house, including women and children, must adhere to the way [of the house], ride a rough horse, and enjoy shooting long arrows (ō-ya) with a strong bow (tsuyo-yumi). It is known by all that a warrior who takes a pretty wife will live a transient life. 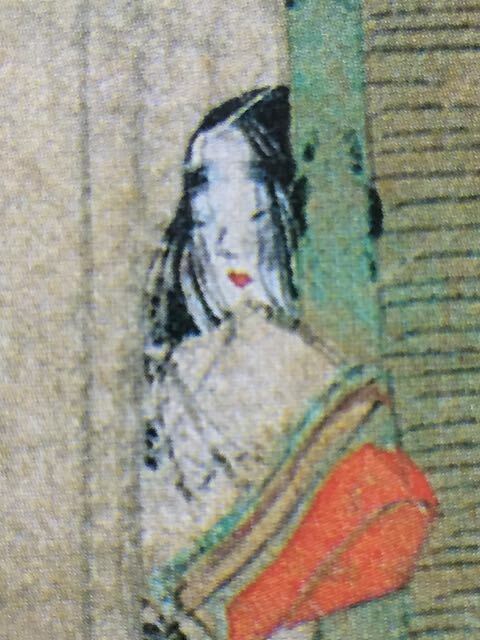 Seeking the least outstanding woman in the Eight Provinces, [Obusuma] married the daughter of Kumeda-no-Jirō. She was nearly seven feet tall, had curly hair that was puffed up, and when looking at her face one could see nothing but her nose. Her mouth in the shape of the letter “he” (Jp. “へ”) spoke vulgarities. [They] had three sons and two daughters. In the second half of the eighth month, Yoshimi Jirō and his brother were summoned to the Capital to perform guard duties. [In the meantime], some seven-hundred brigands of the Three Highways made their way to Takashiyama (Mt. Takashi), Tōtōmi Province, were they laid in waiting for robbing valuables. 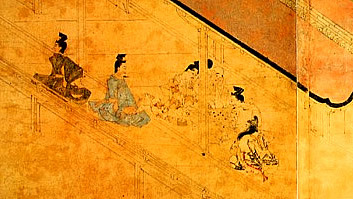 Concerned with lodges for their large entourage, Obusuma-no-Saburō departed for the Capital a day early. The brigands, who heard about [Obusuma's prowess], let [his retinue] pass. 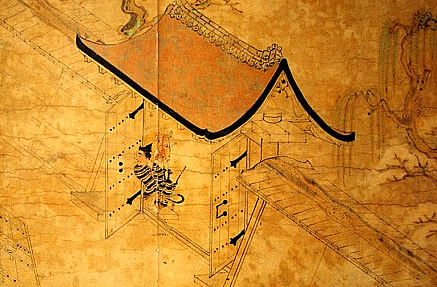 The rear camp of Yoshimi Jirō that followed with one thousand horsemen was making its way to the Capital. The son of Yoshimi’s wet-nurse, Udō Daibu Masahiro, led a vanguard of three-hundred mounted warriors ahead of the camp because it was known since long time ago that there were robbers (nusuto) abound in the bushes under the trees of Takashiyama. Some fifty men were seen coming out from among the chestnut trees in the First Mountain Pass. Only eight were wearing black leather-thread armour, while the others had red-thread armour. [They were equipped with] arrows with mixed feathers of mountain birds, and carrying lacquered bows. 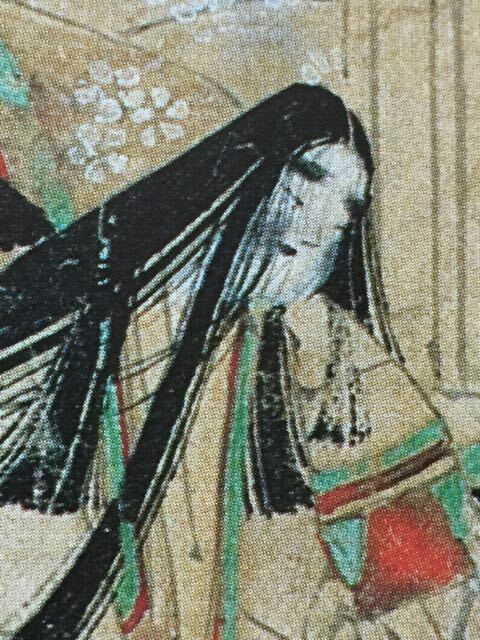 In response, to prevent the robbing of valuables, the warrior Ara gon-no-kami Ietsuna released an arrow that struck Henbai Shōji in the face. 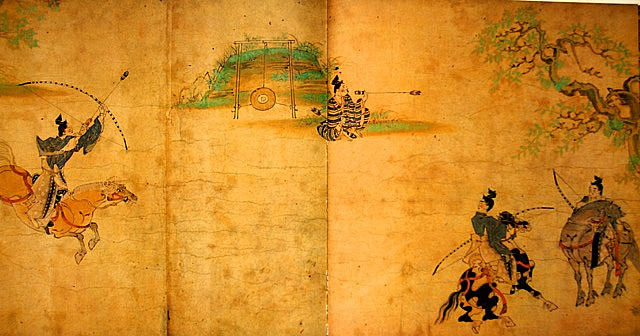 The fallen Shōji’s son, Futamura Tarō, having been rattled [by his father’s death], responded by releasing an arrow that struck Yoshimi through the gaps in his armour. Yoshimi fell off his horse. Udō Daibu carried [Yoshimi] on his shoulders down to the bottom of the slope. Ara gon-no-kami saw this and attacked Futamura Tarō and took his life, decapitated him and stuck the head on the tip of a naginata. Nobody cheered. 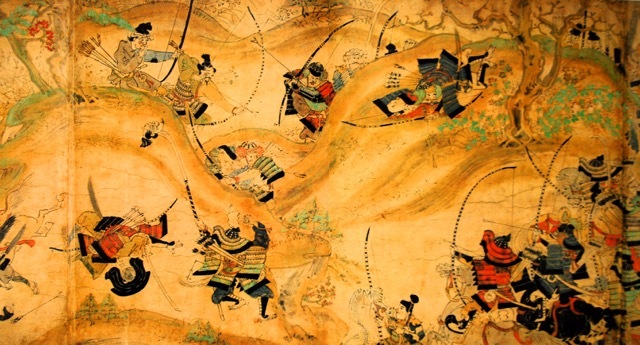 Five-hundred brigands, and some two hundred Yoshimi warriors and samurai were struck. A fast horse was dispatched to inform Obusuma-no-Saburō whose vanguard was making its way to the Capital. Hearing the news, [Obusuma] quickly turned back. Yoshimi Jirō was rejoiced and informed his last testament. Thirty-six land holdings were deeded to Obusuma Saburō. Out of these, the location of Yoshimi’s residence was to be transferred to his wife and daughter. Masahiro and Yoritsuna were to receive Nakata Shimo-go. He then said, “listen to this carefully, and do not abandon my daughter.” It was not before long that Yoshimi was dead. Seeing that there was nothing more to be done, Saburō went to the Capital. [In the meantime], Ietsuna rapped [Yoshimi’s] head and other items in garment (hitatare) and traveled back to Musashi. The following day, as the sun was setting down, he arrived at Kiyomigaseki, Suruga Province, and got off his horse to take a rest. Just then, there was a strange happening that was not a dream. It was rather an unwitting vision. A spirit image (reizō) of Kannon appeared over the waves, about one chō away into the bay in the middle of the sea, and sent a ray of light at [Yoshimi’s] head that was rapped in the hitatare. …Then the image faded away until it was gone. Feeling a sense of comfort, tears of relief streamed down [his face]. Not knowing what happened to Yoshimi of Musashi at that time, his wife and daughter stared at the full moon throughout the night. “In the previous night I saw a dream of Ietsuna approaching, bracing a hawk in his left hand, and holding a helmet (kabuto) in his right hand. The hawk sprung and flew to the west, and the helmet fell to the ground” said the daughter. Feeling uneasy, her mother listened and said, “the hawk represents the spirit of a warrior, and the helmet represents his head….” At dawn Ietsuna came, and with tears gushing down he placed the head and remaining items by his side and said, “look, this is the master of this house” and collapsed, lying in the yard. The wife was overwhelmed by immeasurable grief and cried like a child. Ietsuna told them about the recent occurance at Kiyomigaseki, which slighly comforted them. As for Obusuma-no-Saburō, somewhere along the way back from the Capital he decided to ignore his brother’s will. This was especially cruel. “Since my wife and children are precious, they will occupy Yoshimi’s residence. Jihi and her mother are to leave the house,… “ They were wretchedly pushed out to an isolated house outside the residence. 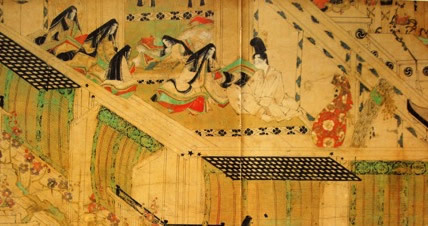 Obusuma and his wife decided to fool the provincial governor who wished to marry Jihi, the pretty daughter of Yoshimi. They informed him that Yoshimi’s wife and daughter had passed away due to a deep grief over Yoshimi’s death. 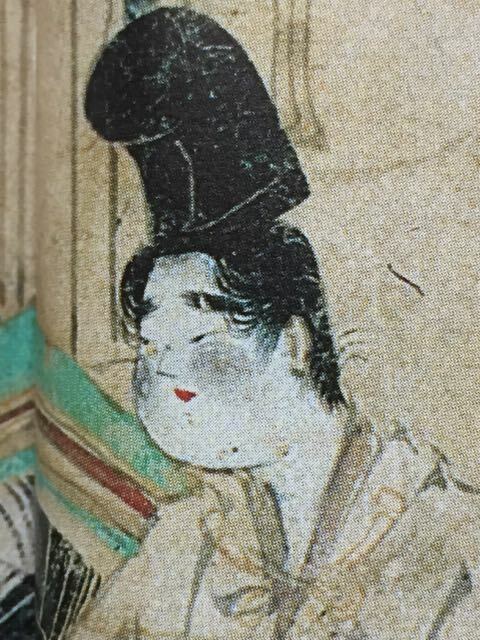 The governor visited Obusuma’s house, but realizing that Obusuma’s daughter was "ugly like a demon" he left and never responded to Obusuma’s marriage arrangement proposal. This illustrative tale is quite peculiar. It is unclear who produced it, who commissioned it, and for what purpose. At first it seems that Obusuma criticises his brother Yoshimi for not following the path of a warrior house. 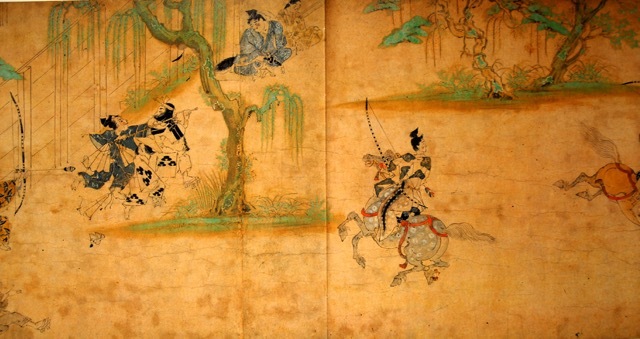 In support of this criticism the author tells us that the mountain brigands recognized Obusuma as a powerful warrior, while Yoshimi is viewed as weak. For that reason they attack Yoshimi, and his death is the final proof of his weakness. However, the author continues and portrays Obusuma as a villain who turned against his brother, ignored the promise he made to Yoshimi on the latter’s deathbed, and even made matters worse by treating Yoshimi’s family in the most despicable manner. 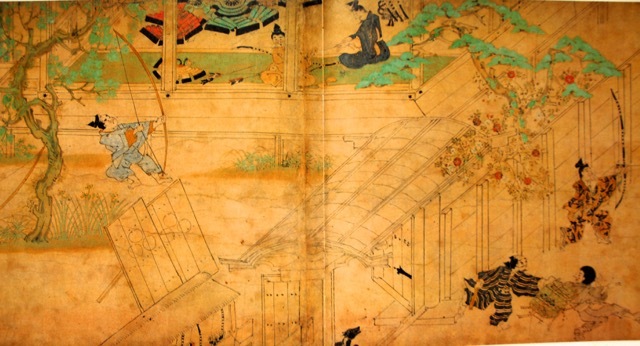 Considering the political atmosphere of dissatisfaction and frustration with Kamakura warriors among aristocrats in the Capital, it is possible that the work was commissioned by an aristocrat or a clergyman, as criticism of warrior society. What makes it even more difficult to determine such matters is the fact that we do not know how the tale ends due to the loss of the second of the two scrolls of this illustrative tale. What is obvious thou, is that Kannon is portrayed as the saviour of Yoshimi and his family, which further supports the assumption that the work was commissioned by an aristocrat or clergyman. In any case, if we were to guess how the tale ends, it would not be unthinkable to expect Kannon to save Yoshimi’s wife, the aristocrat, and daughter and deliver justice. But until the second scroll is revealed, perhaps with the help of merciful Kannon, we will have to accept the uncertainty of the affair.